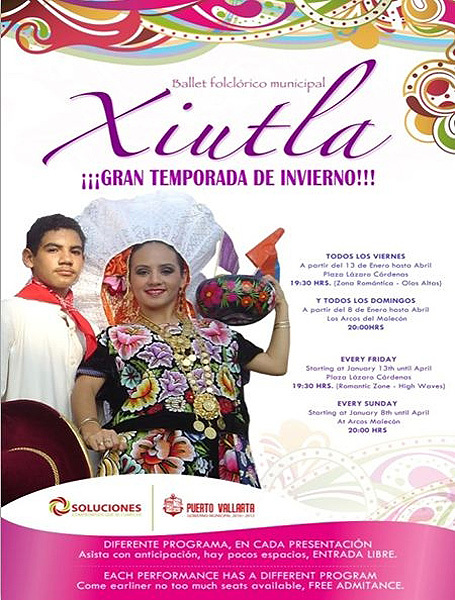 The Arts and Culture Sub-department invites you to attend to the Municipal Ballet Xiutla presentations. Each performance is different, for all ages and at no cost. In the field of folkloric dancing, Puerto Vallarta has the Xiutla Ballet as its representative in charge of taking our artistic manifestations to international levels. With a history of over one thousand presentations, the Xiutla Ballet has always been Puerto Vallarta’s calling card opening doors to new opportunities, it furthers friendship liaisons and complies with the fulfillment of an ambassador’s role, filling with intense emotions every place where it performs. There is no other icon now in Puerto Vallarta that impresses the hearts of other peoples so dramatically as our Xiutla Ballet does.